Brazil is a beautiful country apparent not just in its natural beauty but also its colorful art and folklore. Its vibrant culture of music, art, and crafts means there are plenty of interesting choices for souvenirs, especially if you know where to look. These tips for buying souvenirs in Brazil will help you select the best things to bring home from your vacation in Brazil. Brazil is a country of music. While Samba is the country’s best-known music tradition, you’ll come across many more on your travels from percussion bands like Olodum to capoeira music that accompanies outdoor capoeira gatherings. As you’ll notice, Brazilians take pride in the music and the instruments, and beautifully made musical instruments are available to buy for a range of prices. One typically Brazilian instrument is the berimbau, the main instrument used to create the rhythms of capoeira music. Colorfully painted, handmade berimbaus can be found at handicrafts shops and markets, and they are even sold in children’s sizes. A berimbau is a large instrument, but the airports in Brazil are accustomed to people checking berimbaus as part of their checked luggage. Ceramics are part of Brazilian folklore, and as a result, just about every region you visit has typical ceramics that make perfect souvenirs. In Minas Gerais, look for colorful busts of women that sit on windowsills—these represent single ladies waiting for a suitor. In Bahia, look for beautifully painted Bahiana statues that depict the colorful clothing worn by the people of Bahia. In fact, these ceramics can be found at handicraft shops and markets in the southern cities of Rio and Sao Paulo as well. In rural parts of Brazil, chickens are a common theme for ceramics, while in the north, cute cows draped in red, green, yellow, blue, or white are common—these represent the tradition of the Bumba de Boi festival. Cachaça (pronounced kah-SHAH-sah) is Brazil’s traditional alcohol made from sugarcane. It’s been made there since the time when sugarcane plantations were worked by slaves. A bottle of good cachaça can make a nice souvenir if you like cocktails and want real Brazilian alcohol to make caipirinhas back home. The cost of cachaça, also known as pinga, varies greatly from very cheap to more expensive. The cost is indicative of the quality, so look for higher priced bottles. Even better, take a tour of a distillery, where you’ll be able to try their cachaça and then buy directly from them—smaller distilleries generally make better cachaça than the large producers. Soapstone carvings are a common item found in souvenir shops around the country, but they originate from the historic state of Minas Gerais. In towns like Ouro Preto, you can watch market vendors carve soapstone, which they do by repeatedly chipping away at the soft stone with a tiny pickax. Typical soapstone souvenirs include intricately carved boxes, candlesticks, and medallions, usually for a very low price. These carvings of doves, which range in size from just a few inches to several feet, are very common in certain parts of the country, especially in Minas Gerais. They represent the Holy Spirit and are meant to be displayed over a doorway to bring good luck and protection. The ones made by small artisans can be expensive, but if you’re in Minas Gerais, especially Tiradentes, you should be able to find a beautiful dove for less than 40 reais. 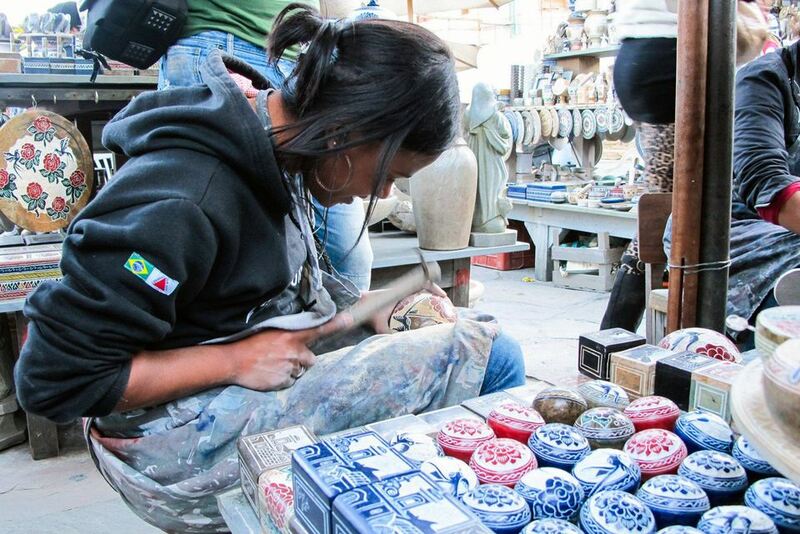 Brazil’s diversity means there is a huge variety of arts and crafts to choose from. One sure bet is FUNAI shops, the government agency for Brazil’s indigenous groups. Look for outdoor “hippie” markets, called “feirinhas hippies,” which are usually held on weekends. Here you can find a variety of fun items, often sold by the artisans themselves, including wood carvings, hand-woven bags and clothing, ceramics, a variety of crafts made from recycled materials, and paintings. Brazil is the world’s largest exporter of coffee, and good quality Brazilian coffee can be found everywhere. Even the store-bought commercial brands are good but look for coffee from smaller brands, especially those sold in the hills of Sao Paulo state and Minas Gerais, where the highest quality and best-known coffee is from. For food souvenirs, try jars of ​doce de leite (offered plain or mixed with passionfruit or other fruits), pacoquinhas (peanut butter treats), pe de moleque (peanut brittle squares), jams made from Brazilian fruits, and goiabada (a delicious guava paste that is very common in Brazil). All of these can be found at grocery stores throughout the country.